This guide is designed to highlight common technical issues that arise while creating a poster in PowerPoint. If you wish to have access to the printers at Bates, you must follow the guidelines in the Essentials section. The Additional Tips section has suggestions for improving the look of your poster and for dealing with common technical issues. I also offer some advice on designing your poster in the Think About Your Audience section. Click on the index below to see a specific topic. Click here for a PDF version of this web page for easier printing. If you want to read more about the principles of good design for a poster, please check out Seri Rudolph's Preparing an Effective Poster (PDF file) from the Bates College Writing Workshop. Once you have the proper size, you may begin adding content to your poster. You may do this by inserting textboxes, images, graphs, etc. If you change the page size after you already have content, you will distort all of the objects on the page. 2. Margins: It is essential to leave at least a 1 inch margin around the edges of the poster. The easiest way to see whether your margins are correct is to use the Grid and Guidelines features. Go to the View ribbon and check out the three checkboxes to turn on the Ruler, Grid, and/or Guidelines features. The Grid will superimpose a grid with one inch squares on your slide. You can turn the grid off again by unchecking the appropriate box. The Guidelines can help you judge the horizontal and vertical center of your poster. These can be dragged to other locations using the mouse. Holding Ctrl while dragging will create a copy of an existing guideline instead of moving it. Important: The Grid and Guidelines features have inexplicably been left out of some version of PowerPoint for Mac. White is the center of the wheel. The best colors to use are the ones immediately around the white center. If you stray too far away from the center (i.e. more than two shades), your background will be too dark to print. During a typical poster presentation, you will be expected to stand near your poster to talk to people attending the poster session. Yours will be one of many posters in the same room or exhibit hall. As you are designing your poster, it's important to think about the different types of people that you will interact with so that everyone can learn something about your project. There are at least three different types of people that will visit your poster. The Skimmer is a person who comes by and reads the basics about your project. They will certainly read your title along with any other text that is written in a prominent font. They will look at your pictures, tables, and graphs and possibly the accompanying captions. Then they will move on. They will probably not talk to you at all. Even though the Skimmer doesn't spend much time with your poster, they deserve to come away with a basic understanding of your project. You should consider communicating your basic premise and results in a large, easily accessible font to appeal to this type of audience. If you do this effectively, some of your Skimmers may become Readers to learn more about your project. The Chatter can be the most aggravating or the most interesting type of person that you will encounter. They will walk up and (sometimes without even reading your title) ask "What did you study?" While it's tempting to point to the brilliant prose on your poster and say "Read! ", this probably isn't the best approach. You will be expected to explain the basics of your project multiple times during a poster session. You should not only think about the best way to explain your project verbally, but you should design your poster to serve as a visual aid during this explanation. You can walk your Chatter through the various steps of your project, pointing out pictures, diagrams, graphs, tables, etc. along the way. You do not want to read your poster to the Chatter, but rather rephrase things in your own words and invite them to ask questions along the way. In order to appeal to the Chatter (and make your job easier when dealing with them), it is important that you have more than just text on your poster. See the sample posters at the bottom of this web page for examples of diagrams that can be great visual aids while explaining your project verbally. With the right preparation, the interactions that you have with a Chatter can be highly rewarding and can even inspire you to apply your project in a new way or give you ideas for future research. You should always include your name prominently on your poster. If you are planning to present within the department, this may be sufficient although some people choose to include their adviser's name as well. Depending on where you are planning to present, you may want to include additional information. For example, if you are presenting at the Mt. David Summit or another campus-wide event, you may choose to include what department you were doing research with. If you are presenting off-campus, you may want to mention Bates College or any other institution that sponsored your project. Use the zoom slider in lower right corner of PowerPoint to view your poster at different resolutions. Use the "Fit slide to current window" button to see the entire poster. Here are some suggestions for types of fonts and sizes. For reference, a 100 point font is about an inch high. For the title, consider using a large, bold san-serif font, such as Arial Black, Franklin Gothic Heavy, Tahoma, Trebuchet, or Verdana. Make the font size between 72-120 points. For the subtitles (authors' names, school name, etc. ), use the same font as your title but make the font size smaller than the title. A font size between 48-80 points usually works best. For the section headers (Abstract, Introduction, Results, etc. ), use the same font as your title and subtitle. Make the font size approximately 50% larger than the body text, between 36-72 points. Make sure that all section headers are the same font size. For the body text, choose a serif type that is very readable, like Garamond, Book Antigua or Bookman Old Style. Make the font size between 24-48 points. Make sure that the body text is the same font throughout the entire posters. DON'T USE ALL CAPS for any portion of your poster. It is harder to read and it looks like you are shouting. To format a text box, right-click anywhere inside it, then select Format Text Box from the pop-up menu. 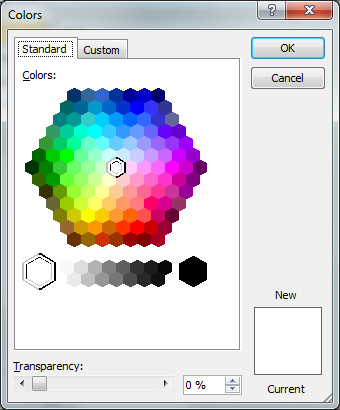 To select a background color with which to fill your object, click the Colors and Lines tab. Then in the Fill area, click the arrow to the right of the Color entry box. You may select from the colors that initially appear or click on More Colors for a wider range of options. To move an object, first select it by clicking inside it. For text boxes, a second click on the border with diagonal lines will yield the border of find dots that is appropriate for repositioning. For object other than text boxes, a single click creates a solid border that is appropriate for repositioning. Then, position the cursor over a border location other than a white square (handle) under the cursor becomes a four-headed arrow. Click and hold the left mouse button. Move the cursor to drag the object to a new location. Grouping objects together: To facilitate rearrangement of objects on your poster, it may be advantageous to group some of them into a single object so they can be moved as a unit, retaining their relative position to each other. To group objects, select one by right-clicking on it. When a border with the white squares appears, hold down the Shift key, then select the next object. Click Draw on the Drawing toolbar, then select Group from the pop-up menu. To confirm that objects are grouped, check that the objects are surrounded by a single set of white boxes, rather than individual sets of handles for each object. To reverse the grouping procedure, click any object in the group. Click Draw on the Drawing toolbar, then select Ungroup from the pop-up menu. Photos taken with a digital camera are usually high resolution and should print well. Scanned images should be at least 150 dpi (dots per inch) in resolution and saved as a high quality jpg file. An alternative to using a photo is to use clipart. To find clipart, choose Insert: Picture: Clipart.... This will open up the PowerPoint Clipart browser which enables you to type a keyword to find matching clipart. Simply click on an image to insert it in the center of your presentation. The advantage of clipart is that it can be resized more flexibly than photos without losing quality. The disadvantage of clipart is that it can appear cartoony and the selection can be limited. When resizing images of any kind, you should avoid distorting the image perspective. The best way to resize an image is to select it and then drag the corner handle. If you hold down the Shift key while resizing it, the height-width ratio will be maintained so that the image isn't distorted. To check whether an image is distorted or not, right click on it and choose Format Picture.... Change to the Size tab. If the height and width percentages under Scale are not equal, the image is distorted. This dialog is also useful for resizing an image to an exact size so that you can align multiple images. You will probably want to resize your graph in Powerpoint. Select the graph and drag one of the corner handles (not the ones on the sides, top or bottom). If you change the relative height and width of your graph while resizing in Powerpoint, all text in the graph will be distorted. However, Excel does not have this problem. If you want to change the proportions of your graph, do it in Excel before inserting it in Powerpoint. If you have already imported your graph, simply delete the graph in Powerpoint, change the proportions in Excel, and copy and paste the revised graph back into Powerpoint. Once a graph is imported, you can still make changes to it by double-clicking on the graph. This will give you almost all of the options that you have in Excel for changing the text and look of the graph. 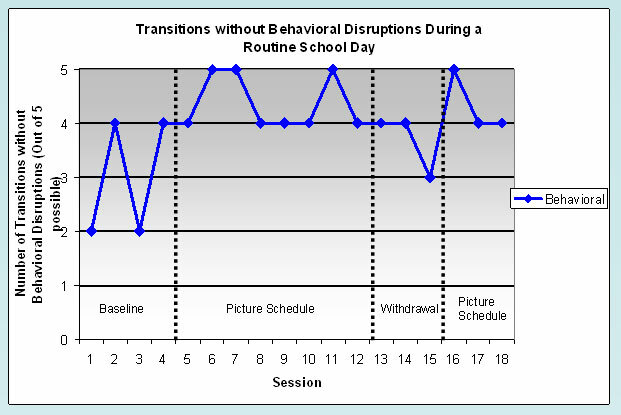 Sometimes you may want to add additional information to a graph besides the basic axis labels, legend, etc. The best approach is to create the the basic graph in Excel, copy and paste it into PowerPoint, and then use PowerPoint to add additional lines, labels, etc. The graph above was modified using this method. The three dotted lines and four additional text labels were added in PowerPoint, using the Line drawing object and text boxes. The title is the first thing that your reader will look at (and hopefully not the only thing!) Your title should be interesting, easy to understand, and encourage the reader to check out your poster in more detail. In addition, the formatting of the title can set the mood for the entire poster. Check out the font suggestions to use in your title. In addition, here are a couple of ways to spice up the look of the title text a little bit. By clicking on the Shadow button while your text is highlighted , you can add a drop-shadow to the letters in your titles and subtitles. In addition to changing the color of the title text, you can also change the formatting of the text box to alter the background of your title. Check out the basics of adding a color fill or a border to a text box in this section. In addition to these basics, you can Choose Fill Effects from the menu in order to fill the text box with a color gradient, texture, pattern or picture. Although there are many options available within PowerPoint for fancy text formatting, if you have access to Adobe Photoshop, you will be able to do much, much more. Using the text tool and the blending options (drop shadow, outer glow, etc. ), you can create almost any text effect you can imagine. Just save your image as a high-quality JPG or GIF and make sure that it is 150 or 300 dpi so that the image is print quality. Then insert your title as an image. (This example uses the recommended Arial Black font.) A word of caution: Photoshop is a very complex application and can be confusing to first-time users. Using Photoshop for your poster project may be more time-consuming than it is worth unless you have prior experience or other assistance. Important: Above all a title must be readable!! Use these tips to draw attention to your title without letting the effects distract from the text itself! If you have blocks of text, a quick way to give your poster a cleaner look is to do a full justify on the text. The default left justify will make the left margin of your text even, whereas a full justify makes both sides even. Highlight the text you'd like to change and go to Format: Alignment: Justify. Although it's perfectly fine to use a white background, PowerPoint gives you quite a few options to spice things up. You may choose to use a different color, a color gradient, or even a picture as the background to your poster. To access any of these options, right-click anywhere on the slide where there isn't already another object (like an image or a textbox). 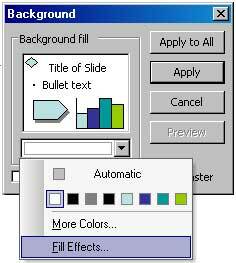 You will see the following menu and can select "Background..."
On the next dialog, you may either select a new color, or choose "Fill Effects..." to try a gradient or an image as your background. The gradient configuration is fairly straight-forward and easy to use. However, remember that even when you are using a gradient, you may not violate the principle of No Dark Backgrounds, so use light colors in your gradient. On the Picture tab of the Fill Effects dialog, you may select a file that will be used as the background image of your poster. While this can be a striking effect, it can be tricky to choose and configure an image. Image resolution is a challenge here. It is practically impossible to find an image that is print-quality at poster scale. For this reason, you must be prepared to accept a certain amount of pixilation and loss of quality. Also, it is best if you start with the highest resolution that you can find. Lightening your image: Almost any unaltered image will be too dark to print and will be too dark for readers to be able to read your poster. There are two ways to lighten your image. The first is to change the image itself. You can open up your image in Photoshop, add a white layer on top of the image and then adjust the opacity of the white layer so that your image is lightened. (You may also choose to adjust the brightness/contrast of the image in Photoshop instead.) Save the file in Photoshop and then use the altered image as your background. A second way to lighten your image is in PowerPoint itself. Apply the unaltered image as the background. Then create a rectangular autoshape that completely covers the poster. Right-click on the shape to adjust the color and transparency settings of the shape so that the background image can show through. In order to have this autoshape affect the background image but not the other objects on your poster, right-click on the shape, and choose "Order: Send to Back". Be careful about using busy backgrounds, as they can easily make a poster look cluttered and hard to read. According to APA style, you should indent all but the first line for any references that you list. (Note: it is not mandatory to list references on a poster. Check with your advisor if you are unsure whether to include references.) In order to do this, list your references in a different textbox from your other text. Put your cursor in the textbox and you will see a ruler with indentation controls around the perimeter of your slide. (If you do not see the ruler, go to View: Ruler to enable it.) Adjust the position of the indentation controls as shown to indent your text. Note: these controls can also be used to adjust the positioning within bulleted lists. Even though your PowerPoint slide is designed to print at a very large scale, it is possible to print the whole thing on a letter-sized piece of paper. This is useful for two reasons. First of all, it may be easier to proofread, check layout issues, and share drafts with others when it is on paper instead of just in PowerPoint. Secondly, some presenters at professional conferences hand out mini versions of their poster to visitors who would like to bring the information home with them. Here's how to print a mini version of your poster. Go to File: Print and make sure that the Scale to Fit Paper option is checked. Now select your favorite printer and click OK.